happy campers after passing the grueling written exam! Teaching has always been one of my deepest joys and inspirations. It seems that no matter what my passion at any given time in my life, I always end up gravitating to teaching. From martial arts, to portrait photography, to art journaling, and now to sailing, I simply cannot resist the pull to be a teacher. I have always taught my friends about sailing, as much as they wanted to learn and to the best of my ability, but it has never been in an official capacity. That all changed when my friend Elliott, the owner of Bluewater Sailing asked me if I would be interested in teaching sailing at his school. Once I said yes, the whole process took on a life of its own, and I continue to be on my way to achieving that goal. 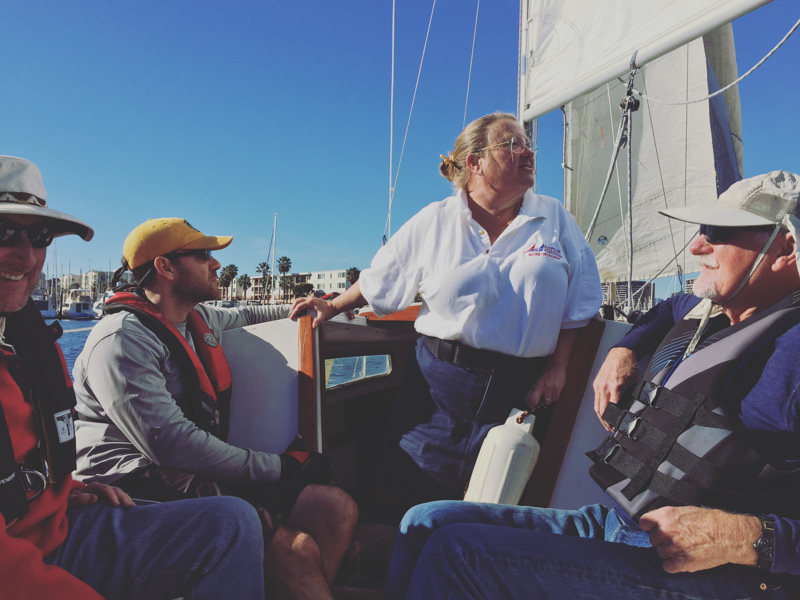 I have had many days of “ride alongs” with other teachers, as well as informal training sessions on his fleet of Catalina 22’s, and most recently completed the ASA (American Sailing Association) Instructor Qualification Training and certification with Captain Wendy Sarnoff here in Marina Del Rey. 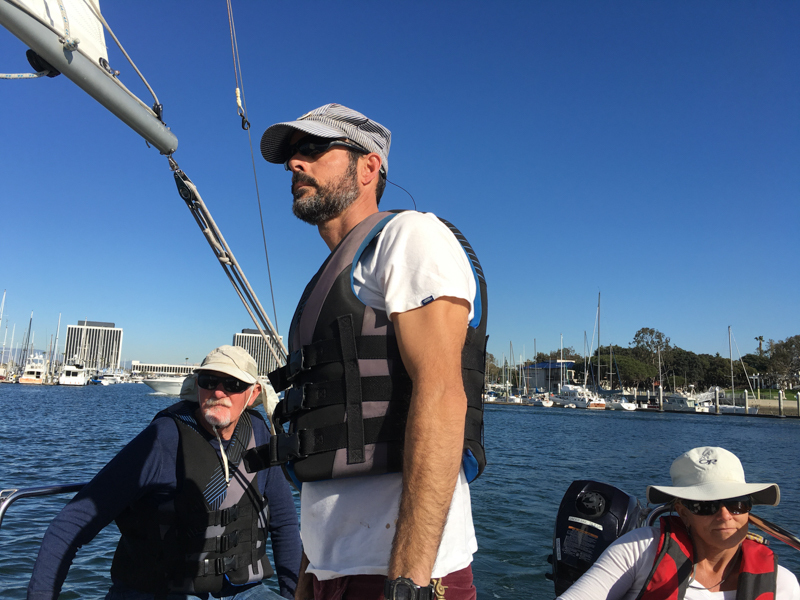 The instructor certification course that I took (ASA 201) qualifies its graduates to teach the ASA Basic Keelboat course. The certification and class itself involves two twelve-hour days, with equal time in the classroom and on the water. During that time, there was much to complete. There was a comprehensive written exam, demonstration of boat handling skills and hands-on teaching demonstrations (both on the water and in the classroom) that had to be completed. There was no stone left unturned, I can assure you! Captain Wendy expertly guided us through the whole process. I was consistently impressed with her ability to seamlessly blend her expertise, experience and teaching wizardry with compassion, patience as well as a strong hand when needed. She is a true inspiration to me, and I look forward to spending more time with her in the future! The other guys in the class were great too. They each brought their own flare and level of experience to the table, and enhanced my experience ten fold! All in all, I couldn't have asked for a better experience! I learned so much about sailing, teaching and of course, myself in this intensive weekend. I am so grateful to each person that was a part of it, and look forward to jumping into teaching at Bluewater Sailing very soon! being silly after a 13 hour day and completing our certification!!!!! feeling exhausted but very proud and happy. I love Captain Wendy!